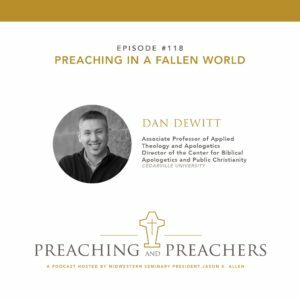 This week on Preaching and Preachers, Dr. Dan DeWitt joins me in a discussion on preaching in a fallen world. Dr. DeWitt is Associate Professor of Applied Theology and Apologetics and Director of the Center for Biblical Apologetics and Public Christianity at Cedarville University. A brief discussion for Dr. DeWitt’s new book Life in the Wild: Fighting for Faith in a Fallen World.